What is the last flower of spring? Poets and gardeners lament the last rose of summer. Even the horticulturally oblivious recognize the wistful symbolism of that flower. But what of the last flower of spring? Who weeps for it? Probably no one. But this lack of concern has nothing to do with callousness. When spring finally becomes summer’s kaleidoscope of color, who cares about a single flower? For that matter, who can define the last flower of spring? Each garden has a unique plant population. Then there’s the matter of defining the end of spring, a season that pays no attention to the grid of dates on the calendar we use to conveniently, if inaccurately, pinpoint its coming and going. People also “date” spring differently. Memorial Day marks spring’s passing for me, but the start of the school system’s summer vacation or an annual fishing trip marks the end of spring for others. The last flower of spring could be a rose. Heritage roses, those flowers of legend, romance and centuries of garden use, tend to bloom with late spring flowers. For me, the last flower of spring is a venerable lemon lily. Perhaps the lemon-colored blooms or the citrus-like fragrance, that evokes spring in Florida’s orange country, inspired the common name. 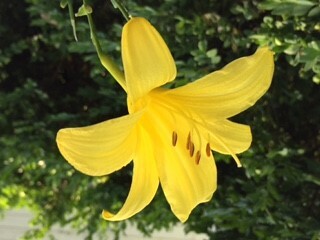 This small day lily came from some ancestor’s garden ages past, along with peonies and garden phlox. My childhood memories have it blooming about the time of the late peonies, but memory is apparently faulty. The last peony had faded when the lemon lily began to perfume the air. While I can’t give proper credit to its family source or common name (much less its botanical moniker), I can thank garden writer Diana Lockwood for keeping this charmer going. She received hers as a passalong plant from my garden a few years ago. Eventually the mother plant vanished, as sometimes happens to the demure in my rather too effusive planting style. When she learned of my loss, a start was provided. This spring it produced several flowers. Lemon lily grows in substantial shade, receiving only four hours or so of direct sun daily. Once my plant grows a bit larger, a division will be placed in a brighter spot. Meanwhile, another year must pass before the air is perfumed with little lemon lily blooms. Fortunately, an abundance of summer and fall flowers lies ahead making this symbolic end of spring easier to bear than that of summer.